One of my favorite galleries in New York City is the Museum at the Fashion Institute of Technology (FIT). Drawing from the museum's own extensive collections, their exhibitions always offer thoughtful and fascinating perspectives on fashion, and their latest show, Exposed: A History of Lingerie is no exception. From stays to bustles, 20s camiknicker to 80s thongs - the secrets of Western women's most private attire and underwear drawer are all on display. "Although this vibrant corset is especially alluring, it was likely marketed as a 'healthy' style. Its curvaceous silhouette was achieved using coraline, a plant-basted material marketed as a more flexible alternative to whalebone or steel." "Coraline...is more pliable and yielding to the movements of the body. 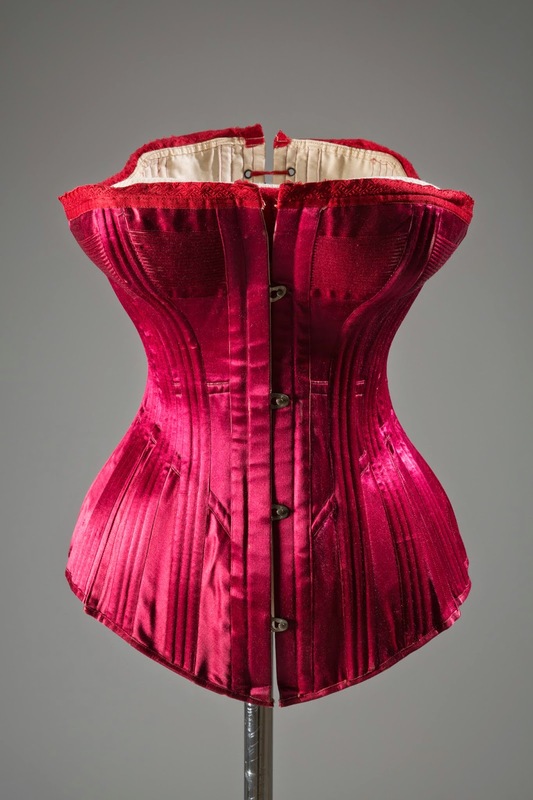 The object of stiffness in a corset is not to convert the form into a rigid statue, to paralyze the action of the heart and lungs, to destroy a woman's comfort and to ruin her health...All the benefit a corset can give is to afford just that degree of rigidity to the waist and chest which shall give graceful curves to the contour of the body, and enable the dress to fit smoothly...[with] the ease, comfort, elasticity and grace of action which come from wearing a Coraline Corset...[in place of] her former instrument of torture." Hmm, that sounds suspiciously similar to the modern sales pitch for Spanx. But wait - there's more! A lady could purchase this corset comforted by the fact that De Ver Warner & Lucien C. Warner were "regularly educated physicians" who had seen first-hand the "effects of badly fitting corsets upon the health of women." The brothers had made it their personal mission "to extend the blessing of properly fitting corsets to the entire community," even "giving up a large and lucrative practice" to do so. "They are mostly New England girls, and very many of them know how to teach school as well as to stitch a corset. We find it is only by employing intelligent help that we can secure the superior quality of work which we demand." Really, how could you not buy one of their corsets? If you'd like to read more, the entire sales piece is online here. If you'd like to read how the Warner Brothers Corset Company eventually evolved into the giant textile and clothing corporation known as The Warnaco Group, here's a link to a short history of the company. Better still, visit the Museum at FIT yourself. Exposed runs through November 15, 2014. If you can't get to New York, highlights of the exhibition are online here. 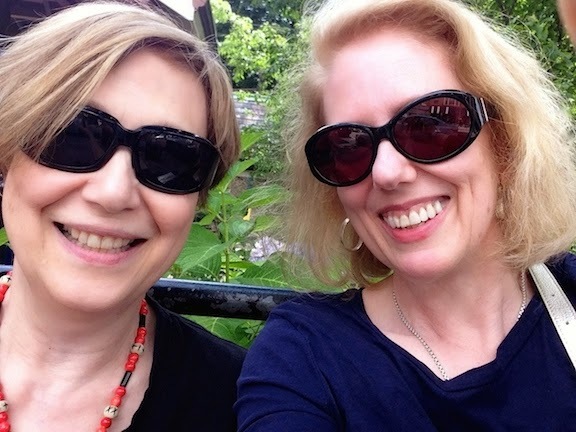 Even better will be a lavish companion book to the exhibition by Colleen Hill, with an introduction by Valerie Steele, to be published by Yale University Press in September. See here for more information about the book, which is already on my wish-list. Above: Warner Bros. Corset, red silk satin & coraline, 1889. Photograph courtesy of Museum at FIT. Another lovely post. I always enjoy visiting your site! Where can I buy this corset, again? I wish they also gave us the legth of the corset. A 10" difference between waist & bust/hips is fairly normal for trim women. It was certainly the norm for me and my girlfriends in our 20s (amd don't forget that an average amount of "spring" in the back would make her actual measurements 2-3" larger). Frances, I WISH you could still buy this corset! It was beautiful just as an object. Isobel, you're completely right about the size of this corset being in proportion. Out of curiosity, I looked at a standard modern dress size chart from Nordstrom, which lists 32"-23.5"-33.5" as a size 00. A tiny size, yes, but the size 12 has the same proportion: 39"-30.5"-40" -- and those measurements are WITHOUT a corset. As you said, add to that the back gap, and it's really not so outlandish. Lovely, feminine, alluring ... imagine this dangling from a Manhattan laundry line amidst the tangle of other lines holding white sheets and draws. Tongues must have wagged. I saw the corset yesterday and in person it's absolutely tiny looking. Colleen mentioned that during press day a view people thought they were for children. She later changed the label to reflect the 22" waist. It's also very red in person and silky looking. There's also a blue corset next to this one and Colleen mentioned that for the time it was pretty rare to have a blue corset. I think it was even earlier than 1889, maybe 1850s? I'm glad you went to the exhibition, Jennifer. I agree that this corset looks TINY - I was frankly surprised by the measurements, but then they measured it, I didn't. *g* I loved the blue one, too. Together they really are a splendid way to open the show! Very lovely blog. I saw you on Booklikes and followed the link here. Going to look around and follow if I can. So glad you included the sales piece - might have to show this to my advertising students as an example of good copywriting!